Here you can buy gift vouchers and special passes to use. This Gift Certificate entitles 1 Person Entry to a Public Skate Session. It excludes skate rental.On.. This Gift Certificate entitles 1 x Entry and 1 x Skate Rental for 1 Person to a Public Session.Once .. 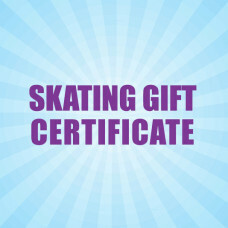 This Gift Certificate entitles 4 Persons Entry and Skate Rental to a Public Session.Once Purchased y..